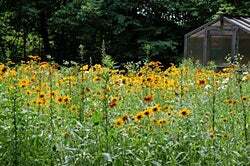 Old Vegetable Garden bursts into bloom in Ohio. It took two years of seeding, but our members Mark and Rene Stover in Marysville, OH, now have a spectacular show of wildflowers where an old vegetable patch once was. 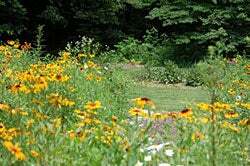 Their success is a great example of how wildflowers can renew and older, underused part of anyone's yard, with very little work, especially when an area is already almost bare to begin with. We've heard from hundreds who created colorful wildflower gardens over septic tanks that had to be opened, leaving bare soil. Others had bare ground due to new construction. 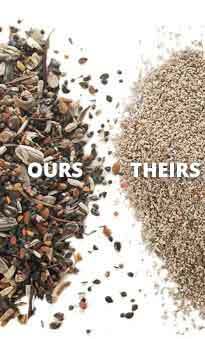 We've also heard from many who just got tired of working with an old perennial patch with decreasing results. 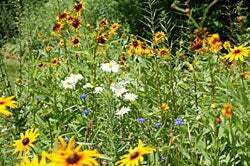 All these homeowners solved their landscape problem with wildflower seeds with great success. If you have an area on your property where the soil is already practically bare, it's a small project to clean out the few weeds or grasses or old plants that are there, and renew it all. It's the easy way for a whole new look, and all the fun of having a whole lot of flowers from very little labor. Rene writes that during the first year of bloom, the patch looked a bit weedy, so they worked at removing the old weeds, and put in some more seeds. The second summer was spectacular.